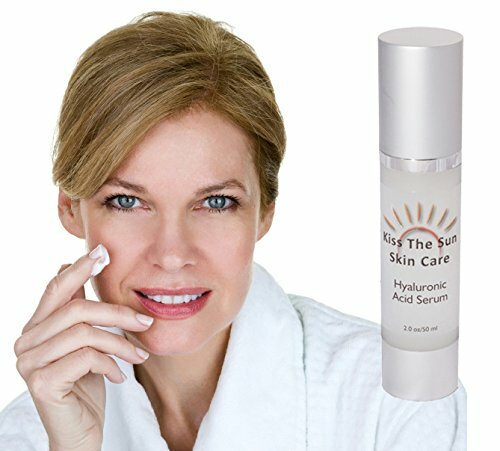 What does the Kiss The Sun Hyaluronic Acid Serum do? With such an amazing range of ingredients, Kiss The Sun Hyaluronic Acid Serum helps to revitalize your skin and make it look younger and smoother than it has in years. The hyaluronic acid adds moisture, the vitamin C helps to reverse the signs of aging and the other nutritious ingredients help to give your skin a radiant complexion. Who should use Kiss The Sun Hyaluronic Acid Serum? Anyone who has dry skin or has noticed their skin does not retain the same amount of moisture as it used to a few years ago. Our skins ability to remain hydrated reduces over time, which is one of the reasons we notice fine lines and wrinkles appearing. Also, if you have noticed that your skin sags more than it should and that you have lost that nice clean edge to your jawline, then this serum can help to increase the amount of collagen in your skin. Another problem is the free radical damage caused by the sun and environmental pollutants and serums with vitamin C can really help to even your skin tone and remove age spots and sun spots. So if you skin shows signs of aging – wear and tear if you like – then this serum has lots of beneficial and nourishing nutrients that will help your skin to look more radiant and youthful. Make sure that you have cleansed your face and neck first and then apply a few drops of the serum to your skin, massaging in gently. Once the serum has absorbed into your skin, apply your moisturizer as normal. If you tend towards dry skin anyway, it is really important to follow hyaluronic serums with a good moisturizer as they can tend to dry your skin. This does sound counter intuitive, but many people find that using a hyaluronic acid serum under their moisturizer makes their skin much more supple and hydrated. This serum contains hyaluronic acid, vitamins C, A, D and E, Witch Hazel, Aloe and Lavender oil. It is paraben free and sulfate free and is made in the USA. The benefits of hyaluronic acid are due to its potent hydration abilities, which means that it can hold more than 1000 times its own weight in water. Known sometimes as the fountain of youth, it delivers a super pulse of hydration deep within your skin where it is most needed. This moisture helps to reduce your dry skin and also to plump up fine lines and wrinkles, making your skin look fresher and smoother. Vitamin C is a strong anti-oxidant that that is essential in cellular repair. This vitamin helps to reverse the signs of aging created from the damage by free radicals. Environmental pollutants and the aging process can make your skin look older than it should. Vitamin C helps to rejuvenate your skin by reducing uneven skin tones, sun spots and age spots. It also promotes the growth of collagen and so helps your skin to look smoother and plumper, with fine lines and wrinkles reduced in appearance. Your skin looks younger and fresher, your skin tone is more even and your complexion more radiant and youthful. Serums with both hyaluronic acid and vitamin C give you super hydration and a more even-toned and brighter complexion. Vitamin A helps to promote the growth of collagen in your skin, making your skin look younger and smoother. As with vitamin C, it also helps to reduce sun spots and age spots and give your complexion a more even tone and vital appearance. Your skin looks brighter and your skin feels softer and more toned. Vitamin D is another potent anti-oxidant and with vitamin C and vitamin D, helps to reverse the signs of aging caused by free radical damage. It is also essential to cellular repair and brings s fresher and more radiant glow to your complexion. A regular ingredient in skin care products, vitamin E (another anti-oxidant) helps your skin look young and more hydrated with fewer lines and wrinkles and a more radiant appearance. This is an old remedy that is used for its anti-inflammatory properties and it also helps repair our cells and tissues. It has been used to aid healing in very dry and inflamed skin conditions, such as eczema and helps to heal sunburn and dry, flaking skin. It also reduces the amount of oil in your skin and is a great ingredient for those suffering from acne. Used by the ancient Egyptians, Aloe is a much loved natural remedy for healing skin and reducing inflammation. It helps to replace moisture in our skin and is said to relieve the itchiness of psoriasis. Aloe itself contains many anti-oxidants, so with this list of ingredients, you have a massive amount of natural remedies that will help to reverse the signs of aging and give your skin the hydration and freshness it deserves. Who doesn’t love lavender oil? The smell is just wonderful. Lavender oil was used by the Romans in their baths to soften their skin and it also has inti-inflammatory properties. It helps to reduce redness in your skin and has been used to reduce the itchiness and heal eczema and acne. Some people are very sensitive to lavender oil, so you might want to skip this serum and try one of the others that does not contain this ingredient. This is a fairly new product so there are not many reviews available yet. PROS: 88.9% of customer reviews gave the Kiss The Sun Hyaluronic Acid Serum a 4 or 5 star rating. Comments that are available have said that this is a great product, that their skin already feels tighter and that they love how their skin feels. CONS: No customers gave this youth serum a one or two star rating. This however, may change as more reviews become available. You can read more customer reviews here: Kiss The Sun Hyaluronic Acid Serum – Customer Reviews. Kiss The Sun Hyaluronic Acid Serum – check out today’s discounted price here.